You know how people always tell you to not wish away the times when your kids are young and with you constantly because when they get older you see less of them? Yet when you have toddlers you think it's not possible that they will ever go away? Well, I can see it happening with Alexis already. She still needs plenty of things from me, but I've realized lately that I don't see her as much as I used to. 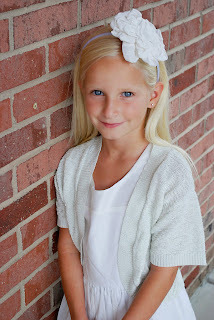 Between being at school all day, piano, tumbling, activity days, friends, homework, her new favorite computer game, and reading, our interactions have dwindled. The boys still follow me around like I've got candy falling out of my pockets (Tyler because he's bored and Ryan because he's that age), so it's not that I'm lonely, but I do miss my frequent interactions with Alexis. That's one reason why family dinner every night is a priority to me, and I've also learned that it's not such a bad thing to sit down with her while she does her homework even if she doesn't need my help. But more importantly, I've seen that if we are interacting less frequently I better do my best to make as many of those as positive as I can. So I guess I should also learn to better appreciate every morning that Tyler is still following me around asking, "What can I doooooooooooo?" because those times will soon be gone too. On another note, see this kid right here? I happen to think he's the bees knees. Sometimes when I have a two-year-old I start to worry that I'm playing favorites, but then I remember that the child is not my favorite (I love them all the same...), but the age is most definitely my favorite. And since they were all two once, they all had their chance at being the favorite! Anyway, I am enamored with Ryan as a two-year-old. In my eyes he can do no wrong (except on occasion), and everything he says is captivating and funny. I'm pretty sure most people feel the same about him, though my vision might be a bit clouded by my bias as his mother. Nearly every night I ask Jeremy, "are you SURE our other kids were this cute when they were two?" He assures me that they were. Lately Ryan's into telling me things are boring. Anything he doesn't want to do is boring. Eating dinner is boring. Wearing any jammies that aren't his doggy jammies is boring. Going to bed is boring. Sitting in his car seat is boring. And when he's mad at me (or anyone) he says, "I'm not playing with you mom!" He knows that's the ultimate punishment. Alexis has trained him to call her "Alexis Mommy". One time she told him to call me "Lisa Mommy" but I put an end to that real fast. I didn't give birth to the child just to have equal ranking with his sister. So during the day he'll ask "When's Alexis Mommy coming home?" He loves her and misses her a lot while she's gone. I'm sure he would miss Tyler too if Tyler were gone all day instead of just part of the day. Because that part when he's home? He makes himself unmissable by torturing Ryan constantly. Ryan also seems really unwilling to give up his status as the baby, and I don't think it has anything to do with the prospect of a new baby either. He just likes being a "little boy". I asked him if he wanted to sleep in a big bed and he declined, saying he liked his crib. He has never once acted interested in sitting on a toilet seat, and if you ask him to he absolutely refuses. If you make the mistake of calling him a "big boy" he will correct you and tell you he's a "little boy", except at the times when he wants to do something the big kids are doing, then he's all of a sudden a "big boy". I don't even know what to do about it. A HUGE part of me doesn't want to cut it, but another part of me knows that it needs to get cut. He's starting to look a little girly, and he has such a cute face that is hidden behind all that hair. But it's so thick and curly on the ends and such a pretty color that I just can't cut it, but...he's not a girl. His nursery teachers have joked about signing a petition saying we can never cut it, but we may have to disappoint them. What would you do? And to end it, a picture of two handsome boys in a moment free:of torture. Do you think I've put off blogging long enough that no one even reads this anymore? I do, but it looks like I'll blog again anyway. 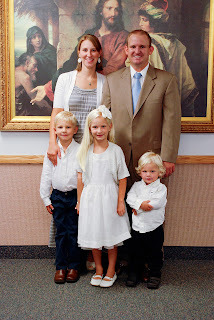 *Alexis was baptized as a member of The Church of Jesus Christ of Latter-day Saints. It was great and we love her. She definitely adds some pizzazz to our family. And I love Ryan in the second picture--he almost has me fooled into believing that he's not the constantly moving insane child that he actually is because he looks like an angel there. *Tyler lost some teeth. Pardon the dirty fingernails. *We enjoyed the fall leaves and did some exploring up the canyons that we now live by. *He also finished up his soccer season. Tyler seems to be a natural at soccer, but he has a tendency to fall down a lot. I think this was his last game, and he probably fell down a million times. We started taking a picture after each time because it was happening SO much. Obviously he's not on the ground in this picture, but I love it because it shows how hard he works. He doesn't ever slow down during the game, he's so excited to be out there and he knows the meaning of the word "hustle". *Jeremy and I also took a Rhino trip without the kids. It wasn't supposed to be this cold when we planned it, but that's the way it worked out. I have NEVER been that cold in my life. Jeremy has taken me out four wheeling in some pretty cold temperatures, but this was by far the worst, so we spent most of the time hanging out in our cabin instead of on the trails. I felt bad for ruining his fun, but he was a good sport about it, and I think he was a little glad that I was there to force us back because it was cold even for him. *We went to a local nature park to feed the ducks and we were swarmed! I'm a little afraid of geese (I know, I'm a sissy), so it made me nervous. But Ryan obviously loved it. *Then Halloween happened. It was the best weather I remember having on Halloween in a long time. Here we have a punk rocker, a transformer (Ryan's costume was a bit snug on him...) and Wolverine, ready to trick-or-treat at dad's office. *In November we planted some fruit trees (maybe that happened in October), and Jeremy poured some cement and moved our shed from one corner of the yard to the other. That involved screwing some 2x4's inside of it, and having about 20 guys over to lift it by the 2 x4's and walk it across the yard. It provided some great Saturday morning entertainment for me, but Tyler slept right through it and was really disappointed that he missed it. *We also had our first real snow, so we took advantage of the empty lots around us and tied a sled to the back of the Rhino and pulled our kids and the neighbor kids around. *We decorated our Christmas tree, and eventually the rest of the house for Christmas. Including hanging Christmas lights on the house for the first time ever! *Alexis and Tyler baked a cake basically all by themselves! They were very proud and it was delicious. And it gave me the idea to have each of them help me make dinner once a week, in the hopes that by the time they are teenagers they will know how to cook so I can put them to work! So far they have loved it and no one has chopped off a finger or burned themselves! *Ryan tried (unsuccessfully) to dress himself, and was really cute in the process. His hair has gotten longer and we've successfully rid him of the pacifier...when he's awake. He can have it when he sleeps only because I want him to continue to sleep, especially in the middle of the day so I can have some time to myself. *Tyler fell off his bike and skinned his forehead. And then they all got new helmets for Christmas. *Then there was Christmas. We did Christmas morning on our own this year, then got together with family later. Christmas morning is always so fun when kids are involved. Jeremy likes to build suspense and make them wait in the hall as long as he can get away with. It's pure torture for them and me. *Alexis and Tyler both got some badly needed new scooters and a whole bunch of other stuff that I can't remember (helmets!). Alexis did get a bunch of new clothes, including some black boots that she's worn everyday since Christmas. She also got another American Girl doll from one Grandma and a painted chest (for her AG doll) with hangers and a beautiful dress from the other Grandma. Tyler got a lot of Lego's, which he sometimes loves and sometimes hates. Ryan didn't get a whole lot because he doesn't care, but Santa brought him a toy workshop with lots of tools and he got some new monster trucks. He also raided every one's stockings and ate all their candy while they were distracted with their new stuff. *We went sledding with Aunt Ashley. Ryan didn't love it so he and I sat at the bottom of the hill and watched everyone else sled. *We spent New Years Eve in Lehi with good friends (and good food) and family. And then January and February happened, and with it, A LOT of snow. Sadly I hardly took any pictures during these months, and the ones I took are on my phone. Jeremy went on a business trip to Laredo, TX. He was born there and hasn't been back since he was a baby, so it was fun for him to see. We missed him...especially since it snowed constantly while he was gone. Also during those months Alexis started piano lessons, Jeremy built a 10 foot wall/replica of a living room in our garage for his dad's booth at the boat show, and the rest of us tried to not go crazy being cooped up in the house all the time. But now it's March, you're all caught up on our life (at least the stuff I remembered to add), and I can feel spring on it's way. We've been dreaming of yard work and how to set up our garden, and the kids can't wait until we get the trampoline we've promised them. Hopefully then they will stop doing flips on my couch!